Kevin Brennan has teamed up with The Brain Tumour Charity to support Brain Tumour Awareness Month in March. Brain tumours are the biggest cancer killer of children and adults under 40 in the UK, and reduce life expectancy by 20 years on average. The impact of a brain tumour diagnosis on quality of life can also be severe, with common side effects including cognitive difficulties, personality changes and fatigue. 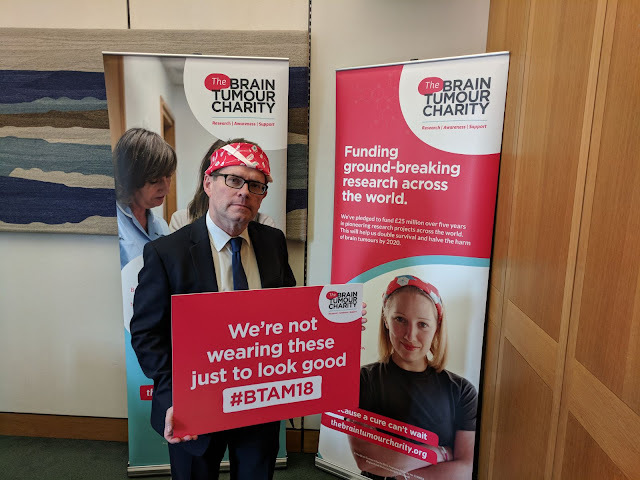 To help raise awareness of the disease, over 30 MPs across many political parties united in Parliament yesterday at an event hosted by The Brain Tumour Charity during Brain Tumour Awareness Month. Brain tumours have featured highly on the political agenda since January 2018, after Baroness Tessa Jowell gave a moving speech in the House of Lords where she courageously shared her experience of being diagnosed with a high-grade brain tumour. After the event, Kevin said: “It was a pleasure to attend yesterday’s event hosted by The Brain Tumour Charity, to help raise awareness of this devastating cancer. It is important that MPs from all political parties endorse the work being done to support people with brain tumours, pushing for earlier diagnosis and increased research to improve survival rates. I’ll be doing everything I can to ensure that people diagnosed with this condition in Cardiff West get the support they need”. To mark Brain Tumour Awareness Month, The Brain Tumour Charity launched a new report on the financial impact of a brain tumour titled The Price You Pay. The report describes how 80% of brain tumour patients have their working life affected after diagnosis, and provides recommendations on how the benefits system can be improved. Cameron Miller, the Charity’s Head of Policy & Public Affairs said, “we launched The Price You Pay during Brain Tumour Awareness Month because it’s vital that we improve life today for brain tumour patients who face financial difficulty post-diagnosis”. “The report is evidenced by survey responses from people that have been directly affected by a brain tumour. Unfortunately, the report displays the harsh reality that many patients and carers face, including reductions in household incomes and inadequate support and information”.